Sheet metal is simply metal that has been formed into flat, thin pieces. It is one of the fundamental forms of metal used in metal stamping processes and can be either flat pieces or a coiled strip. Coiled strips of sheet metal are formed by running a continuous metal sheet through a roll slitter. Sheet metal stamping processes produce large volumes of products and parts with uniform precision at high speeds and low cost. 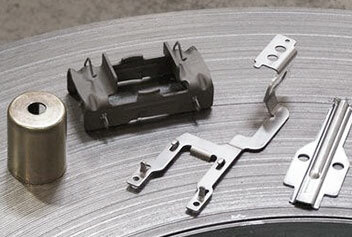 Able to fabricate a number of two-dimensional and three-dimensional parts sheet metal stampings can be parts such as metal clips, spring clips, metal brackets, hub caps, trim, engine mounts, connectors and terminal leadframes. Additional parts formed during sheet metal stamping processes include heater components, pins and oxygen sensors, valves, locks, gears, and household fixtures. Sheet metal stamping companies are able to form a wide range of metal parts, making sheet metal stamping processes essential in industries such as appliance, hardware, aerospace, commercial, wastewater, automotive, electronics, textile, pharmaceutical, HVAC, plumbing and fire prevention. Also, sheet metal stamping services are cost-effective because the process is able to produce material-intensive parts at production rates that are much greater than what is possible using other traditional methods. Sheet Metal Stamping – G & M Manufacturing Corp.
During sheeting metal stamping press operation, the slide, or ram, maintains movement to and from a motionless table called a press bed. The die, a press tool consisting of a specially designed cavity, shapes metal parts from the inserted sheet metal. The upper component of the die connects to the press slide, and the lower component connects to the press bed. 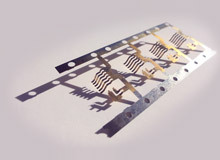 A die component called the punch performs the necessary shaping operation by pushing the sheet metal through the die. After the metal stampings are formed, they are typically subjected to one or more secondary processes. Sheet metal stampings manufacturers use mechanical and hydraulic presses, both of which are available in a wide variety of sizes, tonnage capacities, stroke lengths and operating speeds. Mechanical presses produce energy in the flywheel, which is then transferred to the crankshaft, electric shaft or eccentric gear. Gap frames are a type of mechanical press often utilized in applications where the stock is fed by hand; straight frames are ideal for progressive die and transfer die applications. In hydraulic presses, a controlled force is actuated by hydraulic pressure, which is used to move one or more rams in a preset sequence. Hydraulic presses-which have a variety of types of frames, including C-frames, straight sides, H-frames and four-column, have the ability to deliver full power at any point in the stroke. These presses are ideal for deep drawing, short runs, precision metal stampings, lower-speed high-tonnage blanking with long feed lengths and work requiring repeatable pressure rather than repeatable depth of stroke. Sheet Metal Stamping Sheet metal stamping is a metal forming process in which flat stock sheet metal or metal coils are precisely shaped into metal parts in a stamping press.